If you do not cancel within 14 days after receiving the third magazine, the test automatically extends to a regular one-year subscription. In this case you pay the regular one-year price, starting with the fourth issue, which currently is € 47.60 for seven issues (foreign European countries: € 53.30; overseas: € 63.80). A regular one-year subscription will be invoiced annually. The subscription automatically extends to another year unless cancelled until 6 weeks before the one-year term ends. Warranty: You are entitled to revoke this order within two weeks without naming reasons. This deadline is met by sending off the request on time. This offer is valid for each person only once in three years. Kritiken: Azul, Altiplano, Ganges, Pioneers, Majesty, Keyper, Lisboa u.v.a.m. Jahresindex 2017! 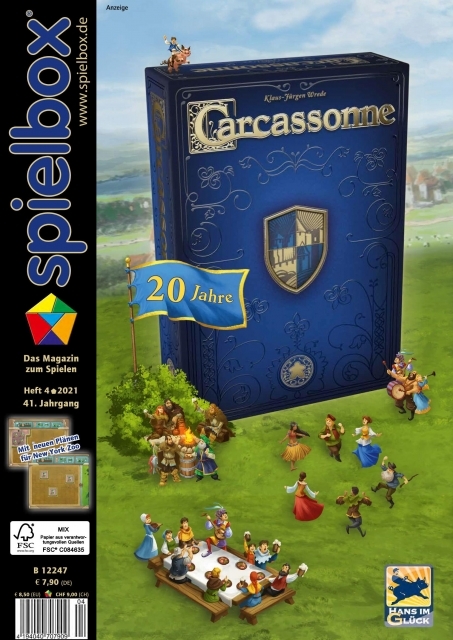 This is the German edition. The English edition will be published beginning/middle of January 2019 and will include 5 add-ons! New tasks for Ghosts of the Moor (TMG). Reviews: Coimbra, Ex Libris, City of Rome, Reykholt and 10 more plus 5 shorter reviews in "At a Glance". This Product was added to our catalogue on Thursday 30 July, 2009.